Here you can find downloadable / printable files (mostly as pdf, if you can’t read it, download Acrobat) and other resources for action. 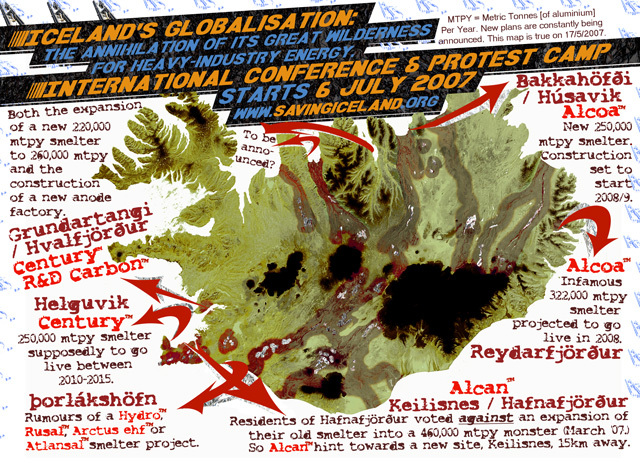 ‘Voice of the Wilderness 2007’, Saving Iceland’s camp and conference newspaper. The newspaper contains articles on the struggles in Narmada, South Brazil, Kashipur, Trinidad, a sermon by Reverend Billy who will preside the conference, a detailed description of the consequences of aluminium production in the extensive article Double Death by Felix Padel and Samerendra Das, an abstract of Eric Duchemin’s presentation of the effects of megahydro on climate, and a range of general information on the Saving Iceland camp and conference. Iceland Under Attack – Maps in English showing the “Intended Master Plan” for the destruction of Iceland / Very useful, but dated in that in a desperate attempt to rescue the glacial rivers it offers the geothermal fields as an alternative source of energy for heavy industry. At the time that the maps were being prepared (in 2004) many Icelandic environmentalists pointed out the folly of such a naive “strategy”. Now that heavy industry has turned its greedy eye on the geothermal areas this sceptisism has been proved right. SI have always been opposed to any use of geothermal energy for heavy industry. Scanned articles on the damming and industrialisation of Iceland. We also host a lot more articles to read – click the ‘Articles’ tab to the left and ‘Destroyed Areas’ (articles specially about Karahnjukar) to the right. Sue Doughty’s answer to Mitchell’s “amendment” to her Early Day Motion which Icelandic media tried to suppress! Saving Iceland video interview for Undercurrents Large file, be patient! 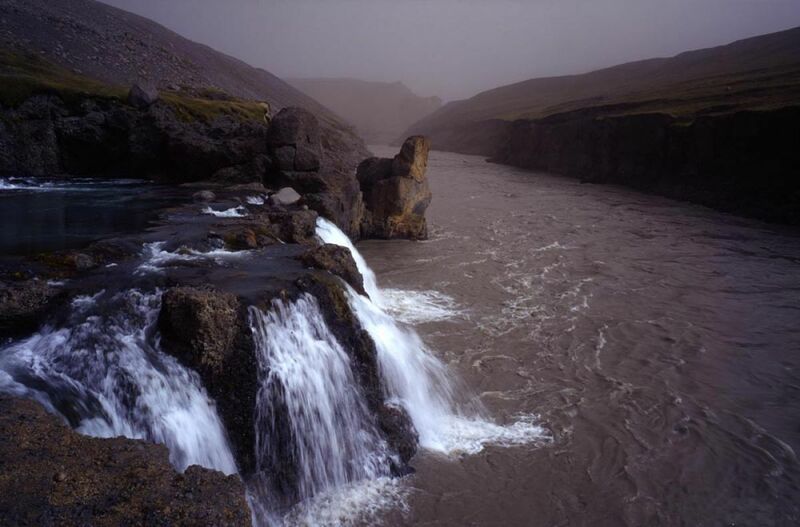 Beautiful slideshow of the Jokulsa a Bru in all its living wonder, Kárahnjúkar and Töfrafoss in August 2006, just before the inundation. Photos by Christopher Lund. Music by Damien Rice. Saving Iceland Illvirkjun/Evil Energy store. T-shirts, mugs, the Evil energy teddy, postcards and much more. Illvirkjun means evil deeds/evil harnessing of energy and is a pun on Landsvirkjun, the Icelandic National Power Company name and logo. Landsvirkjun is in charge of the evil deeds against our wilderness. They hate it!